Minna Salminen Karlsson did a very interesting seminar last week from the DISA research project. It was based on the doing gender perspective. The starting point was that we all behave in a spectrum with femininity and masculinity. In this way of looking nursing is coded as more feminine. And computer science is coded more as being masculine. These two communities also have two ways of looking at the world, and they are very different. For example: Technical rationality dominates the computer science way of looking at the world, whereas nursing is more based on caring ethics. 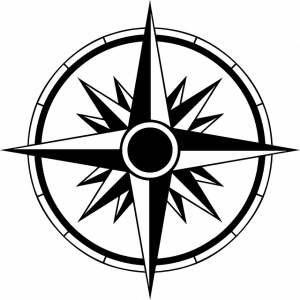 One difference in their world views is that technical rationality is bases on linear time view, whereas nursing care can be circular, parallel to other things and not always linear. Minna Salminen Karlsson also mention several other interesting differences. “Expecting autonomous individuals with linear time”. However, nurses the nurses document at the end of the day and the system is not built for this. Nurses instead do many things in parallel. “Obstructing a holistic view of patients = patients are a sum of their conditions.” The summary of the diagnoses is not useful for nurses, since it is built on the idea that all diagnoses are equally important and a part of the summary. The hierarchy of healthcare is gendered. This matters in the acquisition and implementation of information systems. The issues in and consequences of implementation of IS in healthcare can be better understood if they are seen as influenced by relationship between technology, as something that is mostly “done” by men (e.g. developers) and care, that is mostly “done” by women (e.g. nurses), in a (societal) context where technology is valued higher than care, and where the digitalization of healthcare is pushed forward by perceived economic imperatives. This is exemplified by analyses of the data collected for the DISA project (The effects of digitalization on nurses’ work environment), using theories of gender in organizations and the concept of ethic of care. We are looking forward to hearing more about this interesting research! Last week Diane Golay defended her licentiate degree thesis with an opponent. A licentiate degree seminar is very similar to a PhD defense in Sweden and you have an invited external opponent to discuss the research done. Golay, D., Löscher, I., Lind, T. (Submitted): The Impact of Information and Communication Technology on Work, Workers, and the Psychosocial Work Context: Research Trends from 2000-2017. Golay, D. (2018): Analyzing Work-Related Technology Use From a UX Perspective: The HolisticUX Method. NordiCHI’18. The paper is found here. 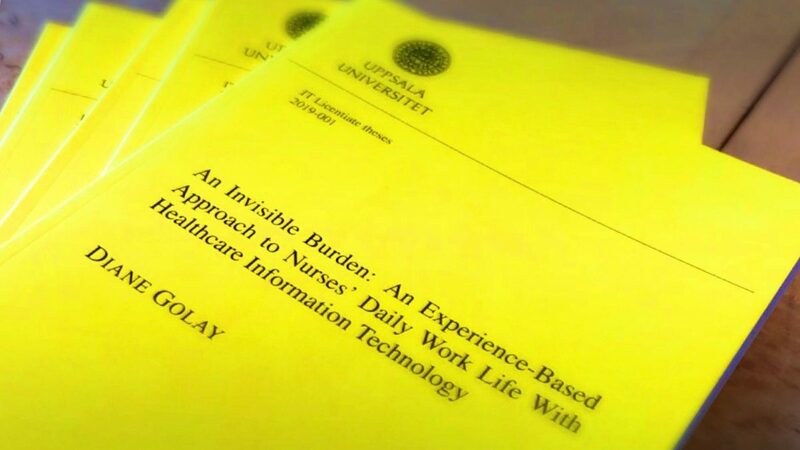 Golay, D. (Submitted): More Work, Same Hours: Invisible HIT-Induced Tasks in Nurses’ Everyday Work. In her work Diane Golay concludes that nurses daily work life with healthcare information technology has clear benefits, such as more efficient ways or working. But healthcare information technology also results in “unexpected, unintended adverse consequences”. According to her research typical issues include “loss in efficiency, extra effort to carry out routine tasks, and the creation of new, HIT-induced work activities”. Diane Golay also concludes that health technology leads to new kinds of work that are invisible in the sense that, for example, these new activities are not recognized by management as work nor something taken into account when introducing more HIT. Information and Communication Technology (ICT) has been an increasingly pervasive component of most workplaces throughout the past half century. In healthcare, the turn to the digital has resulted into the broad implementation of Healthcare Information Technology (HIT). The impacts of ICT on work life have been investigated predominantly through surveys, although some researchers have advocated for the use of a qualitative, experience-based approach. Meanwhile, the existing body of research on the impacts of HIT on clinicians has painted a mixed picture of digitalization. Despite some clear benefits, HIT has indeed been found to have unexpected, unintended adverse consequences for hospital staff. Typical issues include loss in efficiency, extra effort to carry out routine tasks, and the creation of new, HIT-induced work activities. Simultaneously, research outside of the healthcare domain has shown that ICT could require extra effort from some users in order for the sociotechnical system to function properly – extra work often invisible to developers. Based on observation, interview and focus group data collected at a large Swedish hospital, this thesis set out to investigate the impact of HIT on hospital nurses from an experience based perspective, resulting in four main contributions. First, a method supporting experience-based data analysis, the HolisticUX method, is introduced. Second, 13 forms of HIT-induced additional tasks in nurses’ workload are identified, five of which are not acknowledged in previous research. Third, task avoidance is identified as a consequence of nurses’ increased workload, negatively affecting patient safety, care quality and nurses’ professional satisfaction. Finally, four factors are argued to contribute to a suggested invisibility of the HIT-induced time burden in nurses’ work life to management and developers: 1) lack of a holistic perspective, 2) the hidden cost of a single click, 3) the invisibility of nursing work, and 4) visible data, invisible work. After Diane Golay’s great presentation of her work, Lina Nilsson invites Diane Golay to a discussion about her research so far as well as her plans for the future. The discussion, touching on all parts of the thesis and diving into the particulars of the three papers, is mainly centered on how to improve on the work even more and interesting venues and possibilities for this in the remaining studies towards Diane’s PhD thesis. The overall impression of the discussion is of Lina being impressed with the work done so far, and Diane being very grateful for the discussion about the future and the additional input and tips moving forward. The discussion also touched upon subjects such as reliability and validity in this type of research, cultural differences between research areas studying IT in health care such as sociology and computer science, and much else. Throughout, Diane had no problems defending and motivating her choices and proved well aware of the limitations and risks involved in her research. Her research so far has already provided us with interesting contributions to the knowledge in our field, and we are looking forward to her future studies! By the end of the day we celebrated the Licentiate degree being awarded to Diane Golay with a set of delicious cakes. Join the HTO research group at the next SuniWeb Conference in Uppsala the 29 and 30th of April 2019! Three people from our research group will be keynote speakers. All three researchers will be presenting on the 29th of April. First Diane Golay and Åsa Cajander will be talking in the morning about the latest research in the area of digitalisation and the work environment. This includes really interesting results from Diane Golay’s licentiate thesis related to invisible work and IT (from the DISA project). They will also touch upon fragmentation of time, changes in work tasks and the problems related to always being online. Lars Oestreicher will be talking as the final keynote of the conference. His topic will be “How do you create communication systems for people with severe disabilities?”. In his talk, he will talk about web applications and non-excluding design. In this way of doing design you focus on how to isolate the excluding factors already in the design process. He will also talk about his exciting research on young people with disabilities and music as a concrete example of to focus on abilities instead of disabilities. 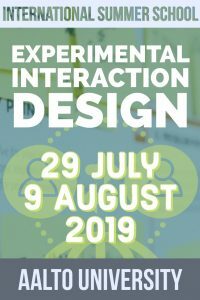 Welcome to an international course on interaction design! This Nordplus funded class brings together practitioners, students, and teachers from Iceland, Finland, Estonia, Denmark, and Sweden to gain a higher level of digital literacy. The course provides the basic skills in user-centred, hands-on interaction design during two intensive weeks, including Google Design Sprint. Members of the HTO group recently got two journal articles published, on the effects of patients accessible electronic health records (PAEHRs) in Sweden. Both studies were picked up by Swedish media after press releases had been published by Uppsala University. The first article, “On threats and violence for staff and patient accessible electronic health records” was published September 28 and written by Ulrika Åkerstedt, Åsa Cajander, me and Ture Ålander. The open access article, which you can find here, is based on Ulrika’s masters thesis and presents results from a survey study conducted with healthcare professionals at the emergency and psychiatric departments at Uppsala University Hospital. Among other things, the study showed that the fear of being exposed to threats and violence from patients increased as a consequence of PAEHRs being launched in Region Uppsala. Shortly after the article was published this press release was published by Uppsala University. The news spread from there and Forskning.se, Dagens medicin, SVT Nyheter and Vetenskapsradion all published their own articles based on the press release. Åsa and I were also invited to write a popular science summary on Ciennce.se. The article by Dagens Medicin and the article by SVT Nyheter also took things further by e.g. adding interviews Åsa Cajander and representatives from the psychiatry department in Region Uppsala! Our second article with a PAEHR theme, “Patients’ Experiences of Accessing Their Electronic Health Records: National Patient Survey in Sweden” was published November 1 and written by me, Åsa Cajander and Christiane Grünloh from the HTO-group as well as several other researchers in the DOME consortium (I introduced all researchers that are involved in the study in this blog post). In this article we focus on patients’ attitudes toward and experiences with PAEHRs in Sweden. It is clear from the results that patients really appreciate the possibilities that the Swedish PAEHR system, Journalen, gives them and that patients want access to new results in their PAEHR within a day after a new examination or visit. You can find many more results, and of course more details about the study, in the open access article published here (please help us share the news!). Even this article was presented in a press release from Uppsala University and the news was once again picked up by Forskning.se and we once again got an invitation to write a popular science version on Ciennce.se. This time around Inera (managing Journalen and several other Swedish eHealth systems), published their own press release about the study. The journal IT-Hälsa also wrote an article based on Inera’s release. Last July, I was approached by someone from the Philips team in London that works on the Future Health Index program. Previously they launched the first part of the 2018 Future Health Index, which is the indicator of the value delivered by 16 national health systems from around the world. For the second part, they wanted to produce some tangible guidelines on how things can improve and drive change within the industry. In order to develop these guidelines, they interviewed 12 key opinion leaders (KOLs) across the Netherlands, US, UK, Australia, Germany, China, Sweden and Estonia – and I was one of them. The interviewer was so kind to send me the transcript of my interview, otherwise I probably would not have remember them. I really enjoyed talking to him, which is not surprising given that people’s experiences with and attitude toward eHealth services is my PhD topic. We started with my PhD research and I gave a background on the Swedish patient portal through which Swedish citizens can access their electronic health records online. We talked about the initial reaction from healthcare professionals and the conflict between the project and the local medical association (you can read about it in this article), how patients receive it, and what I think about this situation compared to, for example, Germany. Research within the DOME consortium indicates that the initial concerns of physicians might not have become reality and that many patients value direct access to their records, increased their understanding of their medical issues as well as their sense of control. In relation to that, I was asked whether the lesson would be to impose the intended change even if it is against heavy criticism of particular stakeholders. This really is a tricky question, especially in a context like healthcare in which a power-imbalance between clinician and patient still exists. I think, if real change is supposed to happen, sometimes consensus is impossible if the people who are supposed to change are against it. But at the end of the day, all stakeholders (like patients, family, physicians, therapists, nurses, management, insurance etc.) are (or should be) “in the same boat” so to speak and work together. The different interest groups described in this paper are likely to continue to exist in an uncomfortable truce with one another, competing for dominance as they gain more or less public appeal, professional credibility, political power, resource and so on. While consensus is not a realistic or even desirable goal, surfacing such things as assumptions and values, and inviting debate on their significance through intersectoral and interdisciplinary dialogue will help achieve what systems thinkers have called ‘accom- modation’ (acknowledgement of, and adaptation towards, other perspectives and practices). Get regulation right.Clearly defined polices and robust data privacy and security standards at the national level build confidence in all parts of the healthcare continuum and help healthcare institutions develop their own data codes of practice, as well as encouraging healthcare professionals and the general population to collect, share and analyze data with greater confidence. Modernize education.Healthcare professionals won’t demand EHRs and AI tools at work if they don’t learn to rely on them during medical training. Increasing healthcare professionals’ adoption of these tools must start with their integration into medical school curriculums. End top-down implementation.Healthcare professionals are unlikely to adopt new tools when they’re presented as a ‘fait accompli’ by technologists. 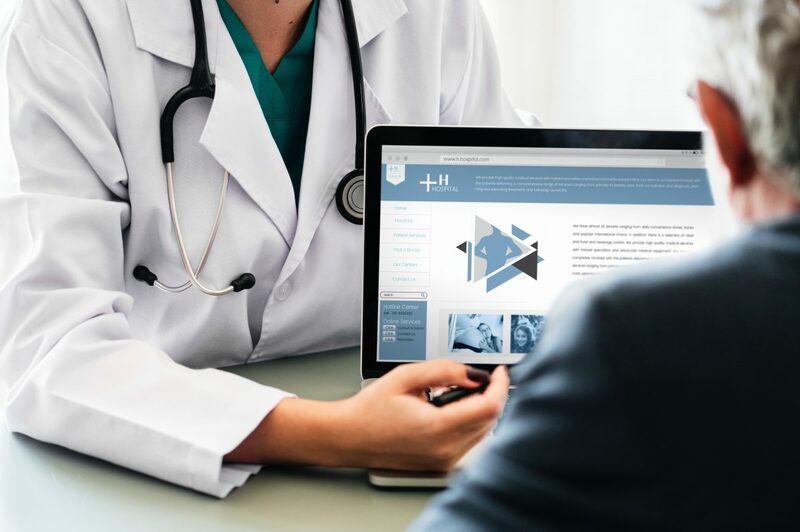 Creating EHRs and AI solutions in collaboration with both healthcare professionals and the general population will have a significant impact on successful integration. Prove and explain value.Both healthcare professionals and patients need to be able to easily understand how data collection and analytics tools make a difference. Constantly measuring and communicating outcomes will create a body of evidence that will help bridge the understanding gap. Harmonize data standards.Companies, healthcare professionals and governments in each market must work together to reach a greater degree of consensus on data formats and protocols. Parts of this post originally appeared in a slightly different form on the my personal blog. Data was collected through the patient portal from June to October 2016. Why do patients in Sweden use Journalen? And how often do they use it? What types of information are most valued by patients? What are the general attitudes by patients towards Journalen? What differences can be identified with regards to attitudes between different county councils in Sweden? The analysis and writing process was led by Jonas Moll. The survey was initiated by 2,587 patients on the national level. The majority of respondents responded to use Journalen about once a month and the most selected reasons for using it were: 1) to receive an overview of one’s own medical history and treatment, 2) to follow up on doctor’s visits, and 3) to become more involved in one’s own care. The top three reasons why patients believe that Journalen is important are that it 1) makes them feel more informed, 2) improves their communication with care, and 3) results in a better understanding of one’s own health status. The most important resource, according to the survey, is test results. In general, the respondents had a very positive attitudes towards Journalen as a reform and considered access to their medical records as good for them. The attitudes did not differ greatly between respondents from different county councils. The paper has been accepted for publication by the Journal of Medical Internet Research, is currently in press, and can be read as pre-print here. 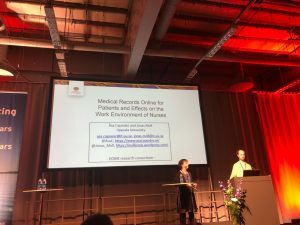 During the first day of the Medical Informatics Europe (MIE) Conference Åsa Cajander and I presented the paper that was introduced in this blog post. Actually, this was the first presentation held by representatives from the HTO group during this year’s combined MIE/Vitalis event, but certainly not the last – we were active on stage, or as workshop leaders, during each and every day! This particular presentation was based on a study that was conducted within the scope of a master’s thesis project at Uppsala University by Sara Englund and Anastasia Hansman. The project focused on the Swedish patient accessible electronic health record system Journalen (and hence was tightly connected to the DOME consortium) and more specifically on how nurses see that Journalen has affected their work environment and their communication with patients. The result of the semi-structured interviews conducted with the nurses at a primary care center in Region Uppsala, first of all showed similar as our earlier interviews with physicians – Journalen has changed the interaction with patients, created an increased workload and created uncertainty regarding when to inform patients of results now that the patients can read even unsigned notes. Even though most of the results were in line with results from our earlier research in DOME, one new theme arose from the interview analysis – the need for new knowledge. Several nurses indicated that education was needed, focusing on how Journalen should be used both by patients and in the clinician-patient relationship. This is an important result, which should be taken very seriously. All conference papers are published open access, so you can find all research presented at MIE here. You can find the paper that Åsa and I presented here.